In May 2011 ATSA and grunt gallery hosted an ALL-INCLUSIVE event entitled “The Pigeon’s Club.” This event took place at Pigeon Park on the corner of Hastings and Carrall in the Downtown Eastside of Vancouver, BC. The event boasted a getaway complete with exterior swimming pool and deck chairs and additional tourist iconography in the heart of Vancouver’s Downtown Eastside, an area where social exclusion and human suffering are among the most intensely experienced in Canada, but where there is also the greatest concentration of mutual aid and frontline services. 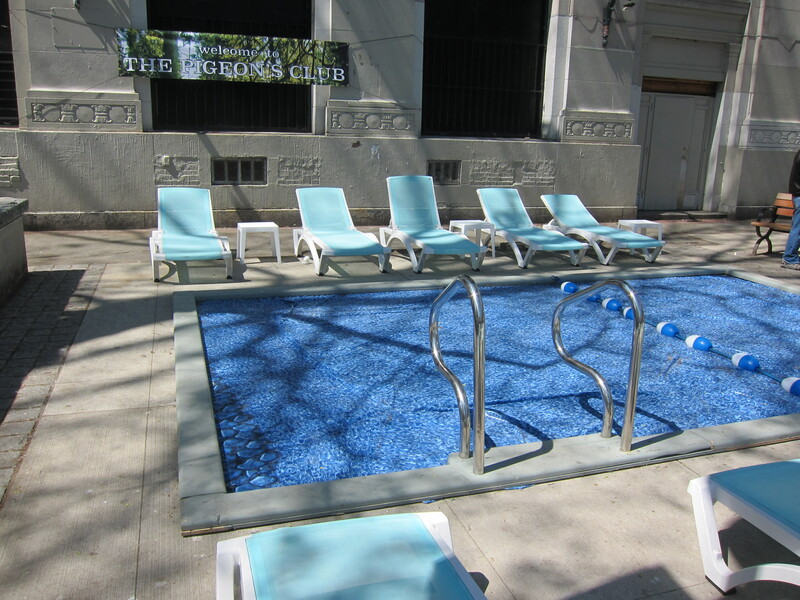 The Pigeon’s Club was a satirical critique of the glossy, squeaky-clean view of the world championed by travel agency brochures, which extol happiness as an all-inclusive package deal. ATSA provided its own outrageous take on the whole aesthetic of the ALL-INCLUSIVE to better pull people’s strings and stir up debate. gruntKitchen produced a video by ATSA titled “in this mean time” and a video documentary of the project by Elisha Burrows. Funding for this program was provided by the City of Vancouver 125th Grants, The British Columbia Arts Council through the Arts Based Community Development Program and The Quebec Arts Council. We also thank The Carnegie Centre, Gallery Gachet and W2 for support of this project. 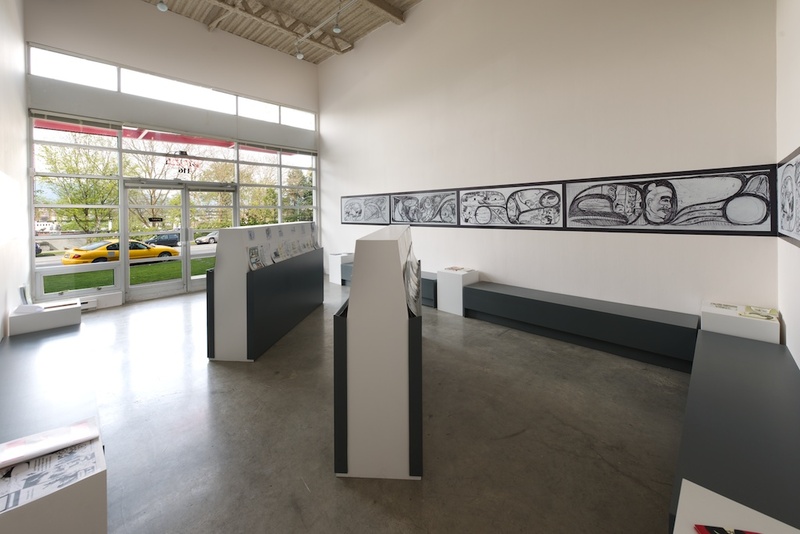 Working with curator Liz Park, Haida artist Michael Nicoll Yahgulanaas presents a selection of his published works alongside previously unseen drawings and sketches from his thirty plus years of graphic art production. Yahgulanaas’ work combines traditional Haida form-line with the conventions of Asian graphic novels known as “manga” in a distinct style he calls “Haida Manga”. This exhibition is coordinated with the release of Yahgulanaas’ latest publication, a retrospective collection of his graphic work, produced in conjunction with grunt gallery. This exhibition at grunt will feature a reading room/ lounge where Yahgulanaas’ previous publications can be reviewed in comfort. Selections of drawings and notes from his archive will be available for viewing and reproduced in large format on the walls of the gallery. Yahgulanaas’ interest in manga and its importance in East Asian culture creates unique cross- cultural dialogue and exchange. The reading room and its contents will open up discussions around indigeneity, issues of accessibility and non-oppositional strategies of engagement. The Old Growth project comes out of the artist’s and curator’s histories of politically engaged work within a broader cross cultural context. Manga is an important and popular cultural force globally, and provides a specific cultural backdrop to Yahgulanaas’ practice. He works out of a Haida tradition of adaptation, pushing the capacities of Haida formline design further through the use of new materials and ideas. Yahgulanaas’ visual storytelling methods expand and cross the boundaries of different artistic disciplines, cultures and sub-cultures, and challenge conventions around exhibiting the Art of Indigenous Peoples. 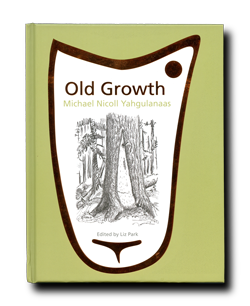 “Old Growth” publication, available for purchase. 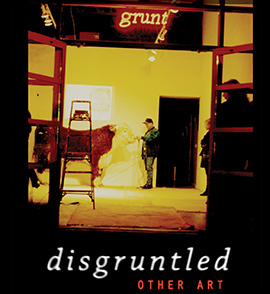 The publication was produced in conjunction with grunt gallery. This project has been made possible through contributions from the Vancouver Foundation and the Hamber Founda- tion. The publication was published in conjunction with Simply Read Editions and Raincoast Books. Grunt gallery celebrated the unveiling of a high-tech media lab called gruntKitchen, a transformation that modified the previously existing kitchen space. The opening represented the culmination of several years of fundraising and planning, and two solid months of renovation. In addition to the support of funders and the work of grunt’s staff and volunteers, this project was realized through the particularly strong show of support in donations made by the individu- als that make up grunt’s community. The Media Lab is a key component of grunt’s Activating the Archive project. Activating the Archive is a multi-year project that involves bringing the archive of grunt’s 26+ years of production into the digital realm through the development of an online, interactive, database-driven website. The MediaLab provides facilities for the digitization of records and capturing of video. It is also a site for a curated program of contemporary artists to develop and from which they can present new media and performance-based work in response to materials found in grunt’s archive. Grunt’s kitchen has been central to grunt’s history as the literal and metaphorical heart of the organization. This small room has been the ‘think-tank’ of our collective where programs and exhibitions have been developed while sipping a cup of coffee. It has also been the place where many new ideas and organizations have come into fruition. With the establishment of the Media Lab, grunt gallery looks forward to meeting its continued commitment to provide artists new ways of presenting and disseminating their work. This project was made possible in part through financial support from the City of Vancouver, through the Capital Grants and Infrastructure Grants programs; Canadian Heritage, through the Cultural Spaces Program; the British Columbia Arts Council, through the Capacity and Sustainability Program; the Canada Council for the Arts, through SOFI; and radio stations 103.5 QM/FM, the Beat 94.5 and TEAM Radio, through the ArtsFACT program. This renovation was also supported by in-kind donations from Coast Decorating Benjamin Moore Paint and Cantu Bathroom Hardware Ltd.
Shop online at our store!